Peta said it was alerting parents to the dangers of childhood obesity, and the health risks of a meat-heavy diet. 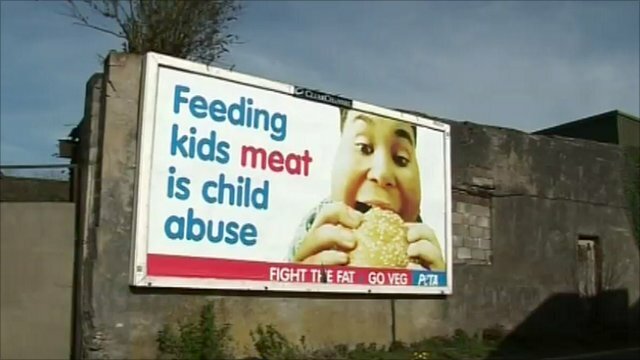 A row has flared over an advert by an animal rights group which claims that giving children meat is “child abuse”. Meat Promotion Wales said red meat was an “essential part of a healthy diet” and it will complain about the poster to the Advertising Standards Authority. The poster on the corner of Yew and Court Street depicts an overweight young boy eating a burger. The People for the Ethical Treatment of Animals (Peta) Foundation said it was hoping to make residents take stock of the Merthyr’s “ballooning” childhood obesity problem. Spokeswoman Mimi Bekhechi told BBC Wales: “We are seeing diabetes in very young children which is typically an adult disease. “We are seeing children as young as three or four with arterial clogging. But a council spokeswoman said: “Unfortunately, the message conveyed in this advert is portrayed as stereotypically offensive and is blatantly inaccurate. “From a children’s services point of view, this advert is at the very least ill-conceived – and at worst may cause distress to an already vulnerable group of children, young people and their families. Meat Promotion Wales said: “Peta’s agenda is to force everyone to peruse a vegetarian lifestyle and they are willing to exploit the suffering experienced by genuine child abuse victims to further their own agenda. A spokesman said the ASA investigated the same image in 2007, and found it not to be in breach of the UK’s Advertising Codes.